Climb aboard a classic locomotive at Railtown 1897, in Gold Country. What's that blooming, just beyond the tracks? 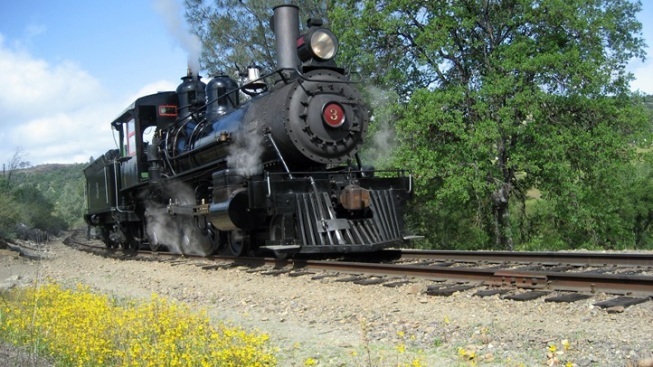 Take a memorable ride along the rails, in the Sierra foothills, on April 13, 14, 20, and 21, 2019. MEADOWFOAM... and goldfields and other pretty petal-popping examples of flora. The whole round-trip is an hour, so while you get up on your wildflower enjoyment, you won't need to commit a whole day or even afternoon. The length of the ride? Six miles, so you'll get to take in a sizable swath of Gold Country, including areas that just haven't changed at all over the decades, save the seasonal changes seen in the natural world. Call it a fresh way to approach your flower love, if you're a train buff, too, toot toot. Tickets? Thisaway.